As the crystal ball drops on December 31st marking the start of a new year, people around the world pause to reflect and to make resolutions. Within the business realm, owners, executives, and marketing professionals do the same—by clearing out their budgets, closing out their books, and preparing for new sales initiatives. Now is the perfect time to make your resolutions for the New Year, especially when it comes to sales and business growth. So what are the most common resolutions made, and how can you apply them to your marketing initiatives? You should consider customers your family, because they are the ones who support your product or service offering. Taking a proactive approach to promoting your brand should be a priority, and reaching out to customers on a monthly basis is paramount. Keeping in touch with them on a regular basis is as easy as sending out print or email newsletters, cards thanking them for their continued business, or post cards/mailers announcing recent success stories or informing them of new product offerings. The best way to organize your marketing initiatives is to develop an annual marketing calendar. Certain times of the year call for different types of promotions with different marketing messages that are tailored to customer needs—you wouldn’t try to sell ice cream in the winter, nor would you try to sell firewood in the summer. And just like the seasons, marketing calendars are cyclical. Most of our clients tend to develop new print sales collateral in the first quarter of the year to promote new sales initiatives or products. The second quarter usually sees an uptick in the development of new logos and identity packages, while the third and fourth quarters are dedicated to launching new web sites (often to promote the new brand identity we have developed). Regular exercise is the best way to increase energy and stay fit, however, most people give up on this resolution (and those fancy gym memberships) by February 1st. In business, sticking with this resolution requires more than simply “making a commitment” to do more selling or promoting your brand: it requires action by adhering to the marketing calendar you create (see #2, above). When sales are going well, or everyone is busy with client projects, it is easy to forget about or ignore your marketing plan—however, getting into a healthy and sustainable routine of continually marketing your product or service is essential to the success of your brand. Change is hard, especially when it comes to marketing strategies. Many businesses don’t realize that just because a tactic has worked in the past doesn’t always mean that it will work in the future. This can lead to spending money needlessly on ineffective and expensive marketing initiatives, such as Yellow Pages ads or Search Engine Optimization (SEO) specialists. There has been a lot of press and campaigning for Social Media marketing—however, a recent IBM Digital Analytics Benchmarks Social Summary report found that social media was only responsible for one third of 1% (0.34%) of Black Friday online sales, and less than one half of 1% (0.41%) of Cyber Monday online sales. Avoid these marketing budget black holes by finding out the best way to communicate with your customers, and how to make your messaging relevant to them. Businesses should always be on the lookout for new trends within the market, new ways of serving their customers, and new competitors who may pose a threat. Sending a survey to existing and former customers is a great way to find out how you are doing: are you providing them the level of service they desire? Is there something else that you could be doing to make their lives easier, thus providing more value to your offerings? Community outreach, charitable giving, and pro bono work, besides being the right thing to do, is a great way to build goodwill and apositive perception of your company. Target stores donate 5% of their profits to the communities in which their stores are located. 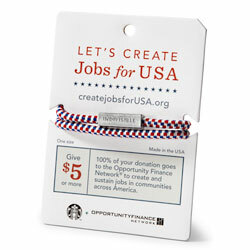 Starbucks created their “Indivisible Blend” and bracelets to help raise money to create jobs during the recent economic crisis and downturn. Showing customers and employees that you care about more than the firm’s bottom line motivates them to become advocates for the brand. Be sure to communicate through press releases or newsletter articles about how you are helping contribute to the community.